I hope you’ve enjoyed the weekend. Yesterday I carried on playing with the Cups & Kettle Framelits Dies and I thought about using the teapot as a vase. I started by choosing a design from the Pretty Petals Designer Series Paper (DSP) Stack . 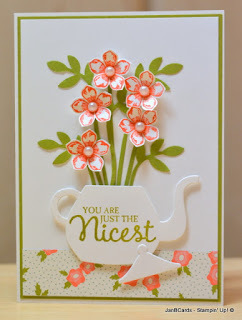 My thoughts were that I’d die cut the teapot in the DSP and stamp the flowers in the same colour. The design I chose is the 1″ strip that goes along the bottom of the card, which meant my flowers would be Calypso Coral (see second card). 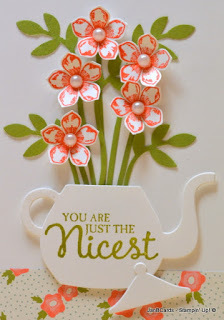 Once I’d die cut the teapot I decided the pattern of the DSP would conflict with the flowers, stems and leaves. When I’d finished the card, I wondered if it would look better with smaller flowers, so I made the Pool Party card. The process to make these two cards was the same with the exception of the flowers and the DSP. I’ll explain how I made the card but when there are differences between the two, I’ll give the Pool Party card details first and the Calypso Coral card details will be in brackets immediately after. I started with a card base of Shimmery White Cardstock with a layer of Pool Party (Old Olive) and a top layer of Shimmery White – all adhered together using Tombow. I cut a one inch strip of Birthday Bouquet DSP (Pretty Petals DSP Stock) and glued it to the bottom of the card front. 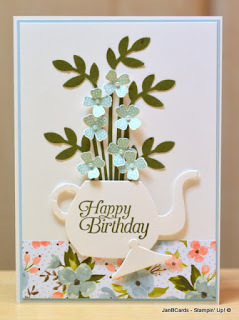 I die cut a teapot using the Cups & Kettle Framelits Dies in Shimmery White Cardstock. I used the Fringe Scissors to cut some strands of Mossy Meadow (Old Olive Cardstock) and cut the strips in half length-ways so I had five stems. I also punched out 5 branches from the Bird Builder Punch. I placed the teapot where I wanted it to go and drew very lightly around it using a pencil. Using this as a guide, I adhered the five stems at varying heights and did the same with the branches. When I’d finishing positioning all the stems and branches I erased the pencil marks. I stamped the flowers from Pictogram Punches (Petite Petals) Stamp Set using Pool Party (Calypso Coral) Ink on Shimmery White Cardstock. 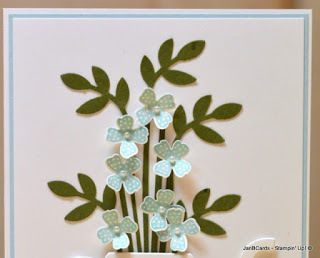 I punched them out using the flower punch from the Itty Bitty Accent Punch Pack (Petite Petals Punch) and adhered them in position using Tombow. I finished off with pearls in the centres. I stamped the sentiment using Mossy Meadow (Old Olive) Ink with the sentiment from the Sky Is The Limit (Picture Perfect) Stamp Set. 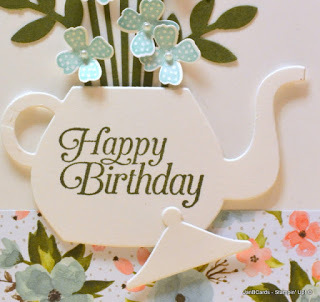 I adhered the teapot and lid to the card using Dimensionals. I’ve decided I like both the small and larger flowers. What a sweet idea for a card in the first place and your selection of cards is just delightful! Thank you for the inspiration and ideas! Thanks, Geraldine. I'm really pleased you find the cards inspiring. ☺ Happy crafting, JanB. Many thanks, Janet. I'm so glad you like my cards. ☺ Happy crafting, JanB. Jan, both cards are lovely my favorite would be the Calypso Coral and larger flowers. I love this color . Just enjoy recieving your blog posts have a Blessed Day. Hi, Donna. Many thanks for your feedback. I'm really pleased to know that you enjoy my blog. ☺ Happy crafting. JanB. Jan, I adore this card! I pinned it on my Pinterest board, but unfortunately, I don't know to link it to your blog. I hope you don't mind. I'll try to figure out how to link to the card on your blog. I love this card Jan ! What a great idea . I've made up a little gift pack using the tea pot framelit and am yet to make the matching card for my friends birthday . I hope you do t mind if I case your card ? Hi, Cheryl. I'm really pleased you like this card and I take it as a huge compliment that you want to CASE it. Please be my guest! ☺ Have fun and happy crafting, JanB. What a beautiful idea, Jan! Thank you so much for sharing it with us! I plan to CASE it at my club next month. And I love your blog & will start following you! Welcome, Cheryl. I'm so pleased you have started to follow my blog. Did you see the Cats in a Cup I posted on Friday 11th March. I posted the video this morning. I am always pleased when I hear my projects are going to be CASED – have fun. ☺ Happy crafting. JanB.